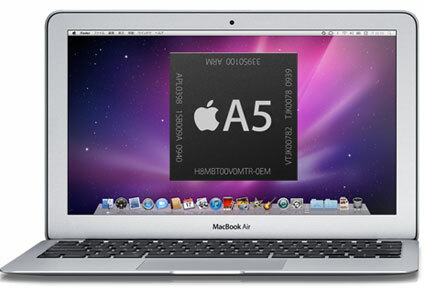 There had been some interesting claims last year that Apple had been actively testing an ARM (A5) based MacBook Air. The ARM processor is the same one that is used in the iPhone and iPad. An ARM-based MacBook Air, however, would raise a number of questions about what kind of device it might actually be. Would it run OS X, or iOS? Would it be closer to a Mac or an iOS device? One of the main advantages of using an ARM processor would be a reduction in power-requirements, but with a corresponding drop in computing power. Using ARM, however, would abandon binary compatibility with existing Mac OS X applications. "Tim Cook reiterated his view that rapid innovation on the iOS platform (and mobile OS platforms in general) will significantly broaden the use case for tablets, eventually pushing annual tablet volumes above those of traditional PCs. We have wondered whether Apple might offer an ARM-based version of MacBook Air at some point; we walked away from this meeting with the impression that Apple feels iPad satisfies--or will soon satisfy--the needs of those who might have been interested in such a product." Based on his conversations with the Apple executives, it seems Gardner believes that the iPad will evolve to meet any needs that might be met with an ARM-based MacBook air. Rumors have suggested that the iPad will likely be getting a significant upgrade in the near future, with a faster processor, improved graphics capabilities and the long rumored Retina display. Of course, Cook is unlikely to divulge specific product plans at analyst meetings, but a complete Apple transition to ARM processors seemed an unlikely prospect regardless. Not surprised. Intel seems to be working out pretty good on this machine. Ok, at least analysts can stop now. We don't have to hear stupid 'theories' and rumors about an A6 Air for some time. That cannot be bad. An ARM-based MacBook Air, however, would raise a number of questions about what kind of device it might actually be. Would it run OS X, or iOS? iOS = touchscreen. OS X = mouse and keyboard. I don't know why we have these persistent debates about OS X merging with iOS, and hybrid touchscreen devices capable of running Mac software. That is Microsoft's approach, not Apple's! Apple understood that a device which tries to do everything, ends up not doing anything particularly well, and ends up adding complexity (for both developers and users) rather than reducing it. So they designed a UI specifically for a touchscreen device. I'd say they've done rather well with this approach. I guess that kills my hope that Apple will offer an"ipad pro"; a Lion based tablet of similar capabilities and dimensions of the MBA 11. Seemed like the perfect way to make win8 tablets DOA. You're suggesting Apple needs to copy Microsoft's approach, the one that's been failing for years to bring a user-friendly tablet to market, to ensure they do well in the market they already dominate? That doesn't make much sense to me. For those that need to do serious work dock station with physical keyboard and external display will be usable (an extension of airplay), for even more computational intensive work, there would be cloud options an VMs. The desktop computer as we know it is going to disappear during the next 10 years if only because it isn't great business anymore. Docking an iPad with a keyboard and display does not a Mac replace. This idea is more or less just another variation on the merging OS idea, to suggest that iOS will simply replace OS X. A pointer device and cursor is intimately more suited to precision work than touching a screen with your pudgy digits (which cover what you're touching). This isn't going to change in the future, unless humans evolve transparent fingers which narrow to a precision point at the end, and the ability to hold their arms extended up to a vertical screen for hours on end. What has been missing is a complete professional experience. Writers, engineers, creative professionals all need a full fledged computer to do their daily work. However, almost all of these could be done better on a tablet if the right hardware and software combination came together. If Apple's latests apps are any indication, this is beginning to happen. Old timers might not like it, but Mac OSX's life is now limited. This ol' timer says no. But of course, this needs to be taken with a grain of salt, as Apple executives have been known to say they're not considering something and then a year later introduce it. You missed the part where I mentioned that the graph is on a sharp uphill climb. In 1 year (possibly less), Apple will be making +/- 80% of its earnings on iOS. That's just one year. By mid decade, that number is very clearly going to be even higher. 88% to 90% in 2013. By 2015, Mac sales will be insignificant to Apple's bottom line. Will they continue to support it? I believe so, but with a much more minimal product line. I anticipate a desk iOS flat panel taking the place of the iMac in under 2 years. The Mac Pro has nowhere to go but down so this iOS device on the high end will probably take its place as well. Mac Mini's niche has always been the starter customer. It was introduced as Apple's trojan horse to win over Windows users but the Windows VS Mac fight is all but done. A low end user will find all their needs met with an iPad at a lower price point than a Mac Mini. What remains are those in the notebook line. If Intel's product map is any indication, we'll continue to see a more powerful MacBookAir that will blur the lines near the MacBookPro. Whatever this melds into will be the single device that is the final frontier for Mac OSX. For the record, I'm also an "old timer" who loves the Mac and don't relish its demise but I won't cling to the past. I'm not cheerleading these changes, merely pointing out what appears obvious once you analyze the available data and trends. Here's all the information you need to know: in just 5 years of iOS (under 2 with the PC successor, the iPad), iOS devices now make up 72% of Apple's earnings as of last quarter. ... and the graph is on a sharp uphill climb. In another year, it's predicted that that number will breach 80%. When 8 out of 10 of your customers are buying an iOS device, when does it make sense to continue supporting the remaining 2 customers? In another 5 years, it'll be under half of 1 customer per 10. Think of which jobs today can replace a notebook or desktop with an iPad or iPhone: Retail, Mobile sales agents (real estate, pharmaceutical, etc), educators, medical professionals, are just a few I can think of right away. Add in all the jobs that don't require a computer at all, and this represents a significant portion of all jobs. All that remain are niche professionals such as engineers, writers and multimedia content creators. Writers can easily solve their issue with the addition of a full keyboard. Engineers, Video, photo and audio professionals are those who still need a Mac/PC but some of those are already being addressed. All you've got left are the manufacturing industry. You won't see iPads running a production line but then again, it's unlikely that you'll have seen a Mac doing that job anyway. These are highly specialized fields that will have customized computers doing the job. So where does that leave the Mac in the next 10 years? Apple doesn't sell a 32 bit version of OS X Lion. ARM doesn't have a true 64 bit CPU design out to build. ARMv8 is not out yet. The ARMv8 architecture specifications describing all aspects of the ARMv8 architecture are available now to partners under license. ARM will disclose processors based on ARMv8 during 2012, with consumer and enterprise prototype systems expected in 2014. How is this even an idea, never mind a rumor? It's insulting to anyone with enough intelligence to read English, never mind understand that LLVM/Clang doesn't even have the architecture in place to test. iOS has covered most people's bases with iPhone and iPad performing most of the daily tasks one has in their personal lives. email, web browsing, information lookup, social media, music, photo and video storage, etc. Old timers might not like it, but Mac OSX's life is now limited. Apple will probably continue developing and supporting it but the future is in iOS. FCPX is clearly suited for a touch screen UI. Aperture for iPad appears to be on the horizon and third party CAD tools are already developing into being as fully featured as their cursor based UI counterparts. Writing professionals such as journalists and bloggers are beginning to adopt iPads as their main tool, accompanied with a keyboard. In my opinion, this is what Tim Cook is referring to. There is no need to port iOS to a traditional notebook, as existing and future iOS devices will work just as well or better. Not even close. You'd know that if you were following the APIs.